Mectron’s ammunition devision has automated capabilities for top of the line visual and dimensional inspection for ammunition, bullets and casings. 8 lasers do 360 degree dimensional inspection and the surface qualifier takes over 100 images per part for 360 degree surface inspection. Mectron’s High Speed Ammunition Inspection Systems are designed to meet or exceed military specifications. Mectron inspection systems provide inspection of bullets, casings, penetrators, primers, and complete cartridge assemblies. Mectron Inspection Systems has become an integral part of providing manufactures the means by which they can consistently supply and satisfy their customers with 100% inspected and certified parts. 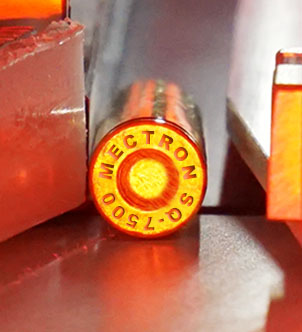 Mectron provides high speed inspection equipment utilizing multiple methods designed for the most critical details of any ammunition application. The Qualifier (Q-5000) uses Mectron’s patented lasers for high speed gauging and inspection for an unlimited variety of ammunition in a wide range of materials. Utilizing Mectron’s patented laser array, the Q-5000 provides 360° inspection of each piece, displays its dimensions on the computer touch screen, and automatically inspects the part features and measurements. In addition to laser technology, Mectron’s new patent pending Surface Qualifier 7500 (SQ-7500) is a camera-based system that uses statistical learning to inspect cylindrical parts. The parts traverse the machine by being rolled along an angled rail by a conveyor belt so that the camera can get 360 degrees of images to inspect the cartridge, casing or bullet. Additional vision inspection of the head stamp or primer is done with a single CCD camera. Using Different configurations provides customers with capabilities to check for case splits, deformations and corrosion, as well as primer inspection.